One of Rome’s most beautiful and distinctive winter vegetables is the broccolo romanesco. 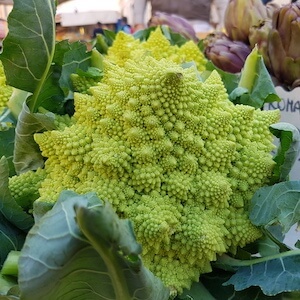 A cousin of broccoli and cauliflower, its bright green, pointed florets are bound to catch your eye at Rome’s markets, while the flavor is pleasingly sweet, nutty and delicate. In Italy, romanesco can be found in the winter months and is often served as a side dish by simply boiling it and dressing it in a little extra virgin olive oil and garlic. But one of the best ways to celebrate this amazing vegetable is to cook it down into pasta sauce for a quick, cheap, and satisfying meal. The addition of anchovies to the recipe adds the perfect background whack of umami to the dish, a hint of chili gives it a warming kick, and a good dose of pecorino romano cheese provides a salty, creamy balance, and helps to thicken the sauce. A short, tube pasta such as penne or rigatoni works best to hold the sauce and it should be cooked in the leftover water used to boil the broccoli for maximum flavor. And if you can’t get hold of romanesco broccoli you can use regular broccoli in its place for an equally delicious dish. Bring a large saucepan of salted water to the boil, divide the broccoli into small florets then cook for 8-10 minutes until just soft. While the broccoli is boiling, finely chop the garlic and chili and warm in a wide frying pan along with the olive oil. Cook for a couple of minutes, being careful not to burn the garlic, then add the anchovies and stir them into the oil until they have dissolved. When the broccoli is cooked, use a slotted spoon to remove it from the water and add the florets into the frying pan with the infused oil. Bring the water back to the boil and cook the pasta for the time indicated on the packet. In the meantime, continue to cook the broccoli in the olive oil, pushing down with the back of a spoon to break up the florets. Add a few tablespoons of the starchy pasta water to stop the sauce becoming to dry and to help to thicken it. Once the pasta is al dente, drain it and add it to the broccoli mixture along with the grated pecorino cheese. Toss everything together until it is well mixed and serve with an extra dusting of pecorino. Learn how to make more authentic Italian family recipes and pick up tips from a real Roman chef at our Local Aromas cooking classes or take a look at more of our Italian recipe collection on our foodie blog. One of Rome's most beautiful and distinctive winter vegetables is the broccolo romanesco. One of the best ways to celebrate this amazing vegetable is to cook it down into pasta sauce.